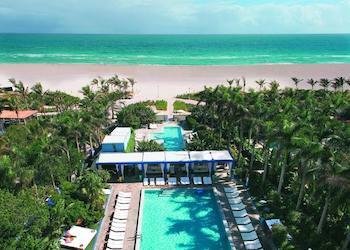 Two fabulous miles of beach line the eastern shore of South Beach offering some amazing hotels for the ultimate splurge. 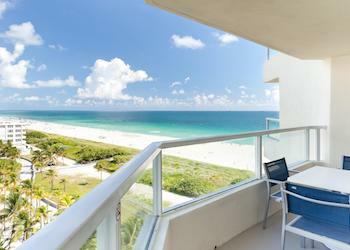 However, not all hotels that bill themselves as oceanfront will be directly on the beach. Hotels on Ocean Drive between 5th and 15th Streets face the ocean-front Lummus Park, so although the hotels technically enjoy "ocean views" they are NOT on the beach. You will have to cross Ocean Drive and a nice short stroll through the park to get to your surf and sand. 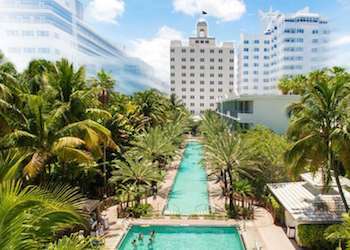 This may not necessarily be a deal breaker, specially if you want to stay in the heart of the action, and if so, check our top hotel picks in Ocean Drive. 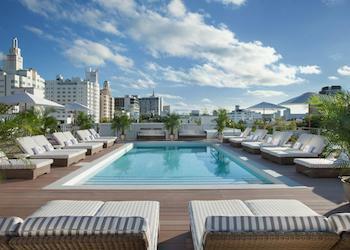 True Beachfront hotels in South Beach will be either south of Fifth Street or north of 15th Street. 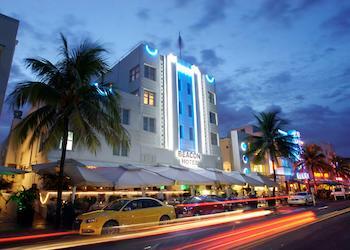 For hotels South of Fifth (SoFi) with direct beach access consider the Hilton Bentley and the Marriott Stanton. This area is a considerably quieter neighborhood and very convenient to South Pointe Park at the very tip. The next batch of beachfront hotels north of Lummus Park will also be very convenient to the hustle and bustle of Ocean Drive and offer proximity to Lincoln Road Mall's endless shops and restaurants, top picks here include: The Loews Miami Beach Hotel, a sprawling South Beach resort, The National, The Shelborne, and Nautilus South Beach a SIXTY Hotel, all newly restored Art Deco historical relics, and The Shore Club with its very lively vibe. 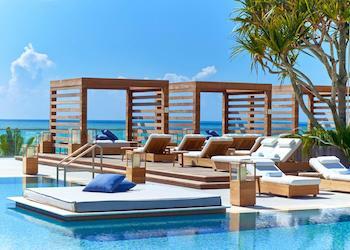 As you move further north of 20th Street, some more superb waterfront options still close enough to the South Beach action though closer to refined Mid-Beach are The Setai, The W South Beach, and 1 Hotel South Beach, with three very different styles. 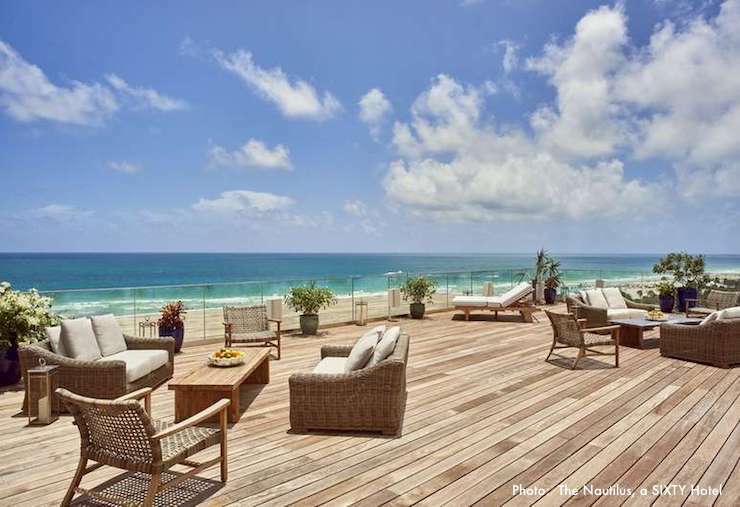 Beautiful beachfront all-suite property on Ocean Drive, next to Nikki Beach Club (read... party) all the way on the south side. Relax at the pool and sundeck, rejuvenate at the Asian-inspired Spa 101, or keep in shape in the fitness room and sauna. The Hilton Bentley offers two world-class restaurants. Dine at Santorini by Georgios, offering authentic traditional and new age Greek flavors, or the prestigious Prime Italian Steakhouse. 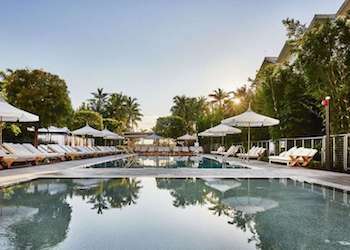 ›› Bentley South Beach is a member of Hilton Honors, pay with points! Luxurious oceanfront resort with direct beach access, has 224 rooms spread over 11 floors, many with private balconies with breathtaking views of the city skyline or the sea. The atmosphere here is a blend of modern sophistication with a laid-back beach vibe. Two restaurants on premises, you can enjoy Mexican classics at Lolo's Surf Cantina or authentic Japanese cuisine and fresh sushi at Azabu. Outdoor infinity edge pool, full-service spa and fitness center. 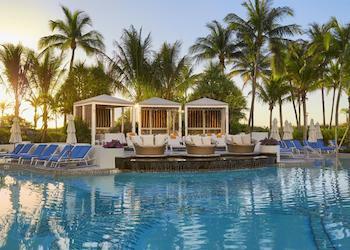 Loews is a 790-room sprawling resort, modern and stylish with a fantastic pool and beach vibe. 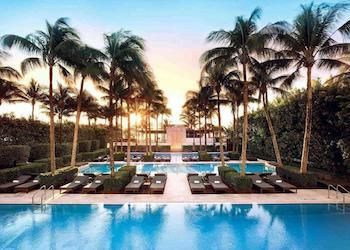 This historic South Beach oceanfront hotel features 116 newly designed city and direct ocean view guest rooms in the Tower and 36 luxurious cabanas and suites, skirted alongside native tropical palm trees and Miami Beach's longest infinity-edge pool. 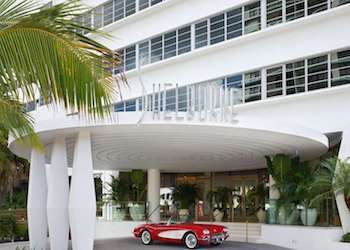 The Shelborne is an original 1940s Art Deco gem offering timeless elegance, breathtaking skyline or ocean views and luxurious privacy in each of its 200 luxurious guest rooms. The Shelborne Caffe is the perfect place to enjoy breakfast, lunch and cocktails al fresco. Root & Bone offers a casual yet elevated dining experience offering American cuisine. Poolside Bar & Grill in the Oasis Garden offers bold flavors with a casual yet tasteful menu paired with refreshing cocktails. Designed by famed architect Morris Lapidus in the 1950s, Nautilus, a SIXTY Hotel has been renovated with homage to its original spirit. Revealing an extensive evolution of what the property once was and stood for, Nautilus, a SIXTY Hotel features a comfortable design that emulates a luxury beach house with public spaces, rooms and suites that have an international and residential feel. Breakfast, lunch, and dinner are served on the terrace or indoor dining room at the Nautilus Cabana Club. This eco-friendly, luxury hotel features a unique, modern design, comfortable, chic and eclectic with a very airy and spacious feeling. The Lobby flows seamlessly and mysteriously from indoor to outdoor spaces. 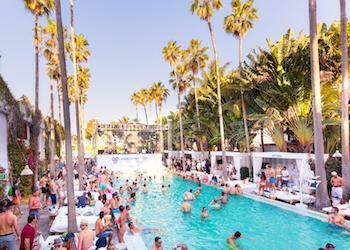 Shore Club South Beach has a very lively pool scene. Blissful zen at this oceanfront Asian-inspired property. 130 rooms and suites spread over a 40-story glass tower (the tallest building in So Be) and an adjacent 1930s Art Deco building. 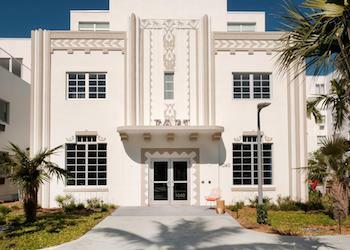 Rooms in the Art Deco building have courtyard or city views. For sweeping ocean views, book an Ocean Suite in the Tower which range from one to four bedrooms. 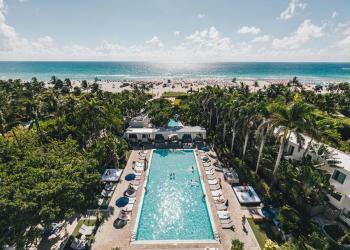 Over the top would be an understatement, everything at The W South Beach oozes hipness and glamour in a contemporary style... high ceilings, dark woods, marble walls, and a $40 million contemporary art collection showcasing pieces by Andy Warhol, Julian Schnabel, and Jean-Michel Basquiat. Two bars and WALL Nightclub, one of South Beach's hottest party spots. 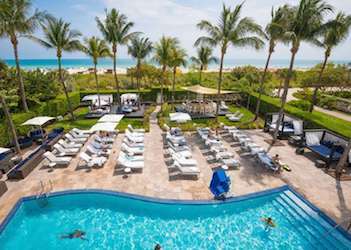 This is a 426-room resort, with a sublime 600-feet of beach frontage, a 30,000 square foot center pool, and a house fleet of white Teslas offering complimentary transport. In keeping with the 1 Hotels philosophy, each room is designed for comfort with pure and natural elements, every detail brings the outdoors inside, all beautifully executed. The state-of-the-art eco rooms include use of tablet with daily digital newspapers, 55-inch smart TV, Bluetooth speakers, in-room water filtration system, and espresso machine with organic coffee. There are 4 swimming pools, all with panoramic ocean views, including an adult exclusive rooftop pool on the 18th floor with mesmerizing 360 degree views and poolside cabanas. Full-service Bamford Haybarn Spa with a selection of holistic treatments, services and classes and a 14,000 square-foot Spartan Gym. Six dining options from grab-and-go to exquisite cuisine, all with an emphasis on fresh ingredients: Plnthouse, Watr at the 1 Rooftop, The Sand Box, Nativ Made, Drift, and the newest signature restaurant Habitat, by Chef Jose Mendin. Family-friendly: Seedlings Program Kid's Club offering a variety of activities including sports, teambuilding and games, swimming, outdoor adventures, arts &mp; crafts.